“Here Far Away,” a monograph of Pentti Sammallahti’s work, was published in 2012 in six languages—a testimony to the high regard in which the Finnish-born photographer is held. The earliest of the 39 black-and-white images at Nailya Alexander is “Helsinki, Finland” (1973), a picture of two ducks relaxing on an ice floe; there is another unoccupied floe beside theirs, the body of water the ice is floating in and, in the misty background, some ships and the harbor-side town. It casts an aura of chill, but also of romantic beauty. Since then Mr. Sammallahti (b. 1950) has traveled throughout Scandinavia and Europe, as well as Asia, Africa and America. Wherever he is, he has an affinity for the local animals: the contemplative monkey on a rock under a tree in “Swayambhunath, Nepal” (1994); the stoic horse beside a stone windmill in“Gotland, Sweden” (1993); the two city birds on a sidewalk in “Houston, TX” (1998); the dutiful dog guarding a pile of used tires in “Cilento, Italy” (2000). Mr. Sammallahti’s prints aren’t large; many are quite small. 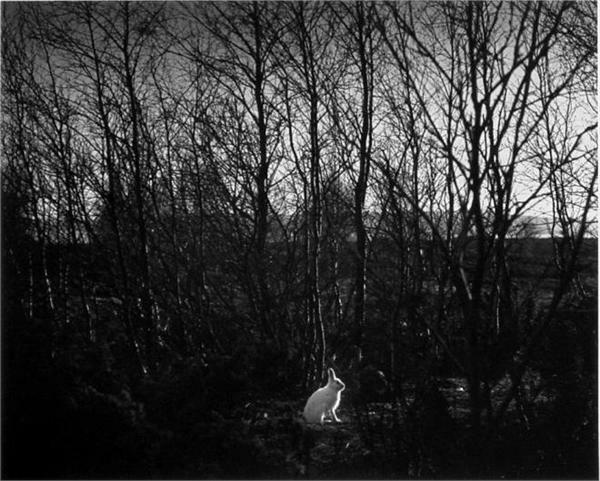 “Signilskar, Finland” (1974) is only 3½ inches by 4¼ inches; it is a picture of a white rabbit, seen in profile, sitting in a stand of dark trees. This is an image of great delicacy. You get close to it to study its details, the way you get close to a Rembrandt etching. This entry was posted on March 9, 2013 at 7:37 pm and is filed under Uncategorized with tags Nailya Alexander Gallery, Pentti Sammallahti. You can follow any responses to this entry through the RSS 2.0 feed. You can leave a response, or trackback from your own site.